Preheat an oven to 350 degrees. Slice the baguette into 1/3 inch slices. Lay the slices out on a baking pan, drizzle with olive oil and place in the oven. Cook until lightly browned and crispy. Zest 1 TBSP of lemon rind and add to crème fraiche. Either roast corn in the oven, or toast over a burner until cooked. Cut off of cob and mix with tomato, onion, and parsley. Mix in parsley, 2 TBSP olive oil, and juice of half a lemon. Season to your taste with salt and pepper. Allow to sit for 30 minutes before serving. To serve spread some crème fraiche on a crostini. 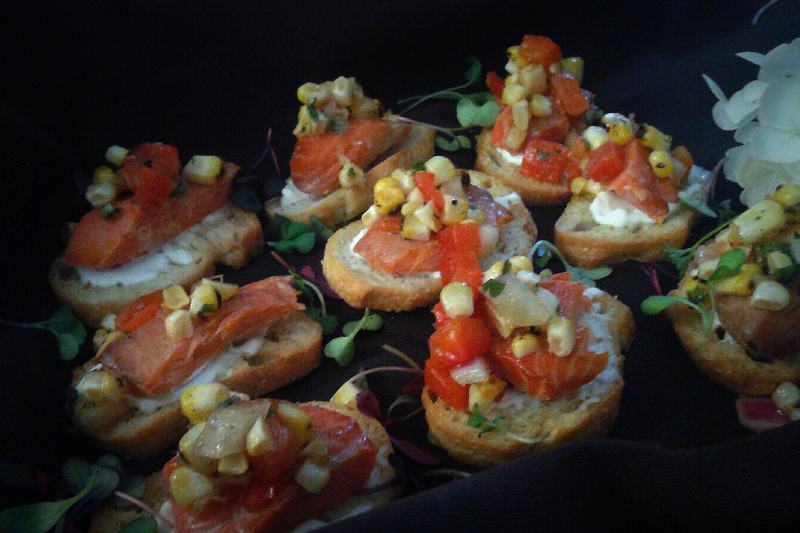 Break off a nice piece of smoked salmon and top with corn salsa.